Gabriella has trouble controlling her newfound powers in the second novel of the Hidden World of Changers series. Gabriella, Darren, Fiona, and Mack are Changers, a magical line of shapeshifters that can transform into mythological creatures, from werewolves and selkies to lightning birds and spirit foxes. And they’ve just saved the world from a warlock bent on destroying life as we know it. Now, the Changers are training hard to control their growing powers. Something that seems easy for everyone except Gabriella. Gabriella loves the speed and strength that comes with being a jaguar, so much so that her transformations are out of control. If she changes during a soccer game, everyone at school could learn her secret. But then Gabriella finds a green mask and an old newspaper clipping in the attic. The article is about The Emerald Wildcat, a Changer just like her who fought crime as a masked heroine. 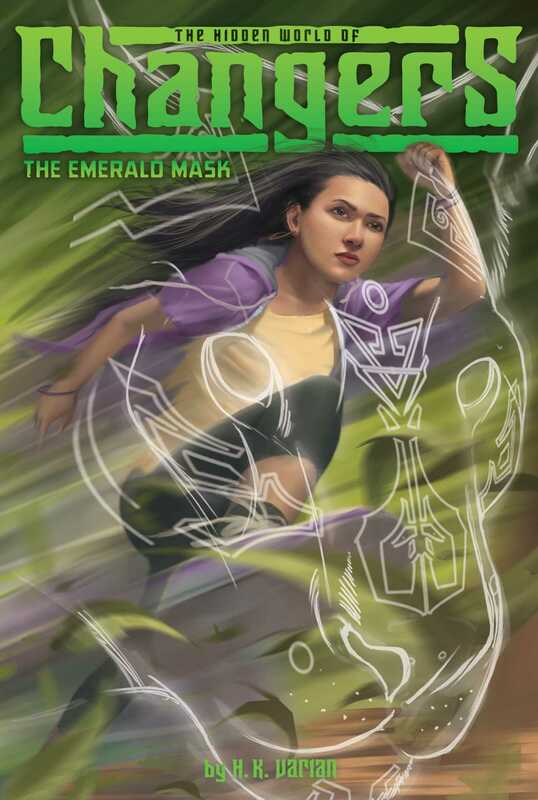 Holding the emerald mask in her hand, Gabriella wonders, does the mask belong to her mom? Could her mom really be a superhero? And more importantly, could she help Gabriella get a handle on her powers? The next day Fiona Murphy hoisted her heavy backpack over her shoulder and shuffled out of the cafeteria the moment the bell rang to end lunch. Most other kids were still eating and laughing, balling up their trash and trying to throw it into the garbage can while the cafeteria monitor’s back was turned. But Fiona’s next class was all the way across school, and she was not the kind of student who got tardies. Ever. And especially not when her first big homework assignment of the year, an oral and written report, was due. A worried frown crossed Fiona’s face just thinking about it. This was the first time in her entire life that she knew, deep down, she was about to get a bad grade. Fiona studied hard for every quiz; she always had her homework neatly completed on time. This report, though, had been impossible. Fiona had done her best, of course. She always did. But even Fiona had to admit that this time, her best wasn’t good enough. And that was a very hard thing to face. It’s too late to do anything about it now, Fiona reminded herself. Better get it over with. Soon, Fiona reached the Ancillary Gym, the place where her life had changed forever on the first day of seventh grade. Along with three kids she barely knew—Gabriella Rivera, Darren Smith, and Mack Kimura—Fiona had discovered a secret about herself that even now, even after everything that had happened, was still kind of hard to believe. She was a Changer, part of a magical line of shapeshifters that history had forgotten. Changers hold incredible power and can transform into different creatures from mythology. Fiona had learned she was a selkie and could transform into a seal. Darren, an impundulu, could become a massive bird and shoot lightning bolts from his hands. Mack was a kitsune and could change into a magical fox, just like his grandfather. And Gabriella, a nahual, could transform into a powerful black jaguar. In addition to transformations, each one had special powers that they were still learning how to use. Their teacher, Ms. Dorina Therian, was a Changer too—a werewolf, to be precise—and guided them through their powers and intense training every day. Though Fiona had been the first one to leave the cafeteria, she was the last one to reach the Ancillary Gym. It was like her feet had dragged on purpose, doing everything to delay the moment when she had to give a less-than-perfect presentation. She took a look at the other students, but nobody else seemed even a little concerned. Gabriella and Darren were chatting together on the bench while Mack was sitting on the floor off to the side, furiously sketching in his notebook, surrounded by comic books. The way Gabriella’s shoulders stiffened was barely perceptible, but Fiona noticed immediately. “What do you mean?” Gabriella asked. Gabriella stared at Darren and Fiona for a moment—long enough for Fiona to see a glint of gold flash through Gabriella’s eyes. “I thought . . . ,” Gabriella moaned, her voice muffled. “Is it really noticeable out there?” She buried her head in her hands. Fiona shivered. She knew she’d never forget what had happened. A power-hungry warlock, Auden Ironbound, had used an ancient magical horn—the Horn of Power—to bind hundreds of Changers to his will. He swept up the coast with his army under the cover of a hurricane, straight for Willow Cove! Even the First Four, some of the most powerful Changers to ever live, had fallen under Auden Ironbound’s spell. Luckily, Fiona, Darren, Mack, and Gabriella were too young to be affected by the horn. Somehow, they’d managed to beat Auden’s army, but Auden got away. Everyone knew the warlock would be back. Mack looked up from his sketch, startled. “Sorry. What did you say?” he asked. “What are you doing?” Darren asked. “Can I see?” asked Gabriella. Mack slammed his sketchbook shut, gathered his comics into a pile, and joined the rest of the class. “So what did you learn about kitsunes?” asked Gabriella. Darren let out a long, low whistle. “No way,” he said, clearly impressed. There was a pause before Fiona opened her mouth to reply. Then, just in time, the door opened. As she strode across the floor, her long black braid, streaked with silver, swayed behind her. “Your reports, please,” she announced, holding out her hand. Everyone scrambled to pull their reports out of their backpacks. Fiona placed a single piece of paper on top of the stack. Ms. Therian had to notice how much shorter it was than the others, but she didn’t say anything. Normally, Fiona would be the first one with her hand in the air—but today, she was all too happy to let someone else go first. She listened attentively to Gabriella’s oral report and then Mack’s and then Darren’s. The facts they had learned about their Changer abilities were so fascinating that Fiona almost forgot the dread she was feeling about her own presentation. Here goes nothing, Fiona thought as she stood up. She took a few steps forward and then turned to face the bench. Her classmates were smiling at her—not the sarcastic smiles she saw sometimes in her regular classes, but real, true, genuine smiles. “?‘The Secrets of Selkies,’?” Fiona began. “Selkies are Changers who take the shape of a seal. They originated in Ireland and Scotland, where tales of selkies have been passed down from generation to generation. Every selkie is born with a sealskin cloak that allows him or her to transform. Without it, a selkie is trapped in his or her human form, so selkies must guard their cloaks carefully. Fiona stopped speaking abruptly. There was more she wanted to say about that, but the words seemed stuck in her throat. “Have you seen another selkie before, Fiona?” Ms. Therian asked, filling the silence. “Of course,” replied Ms. Therian. “Have you made contact?” Ms. Therian asked evenly. Fiona glanced down at her note cards, but she’d already said everything that was written on them. “That’s all,” she said as her cheeks started to burn with embarrassment. “Thank you, Fiona,” Ms. Therian said. Fiona returned to the bench and stared straight ahead. Ms. Therian’s words had made her feel a little better—and a little curious, too. Who would teach her the selkie songs? An image of the copper-colored selkie flashed through Fiona’s mind. She couldn’t wait to see her again . . . but when? “Now that the presentations are out of the way, I have some news to share,” Ms. Therian continued. From the tone of her voice, everyone could tell that Ms. Therian’s news was big. The mood in the room changed at once.